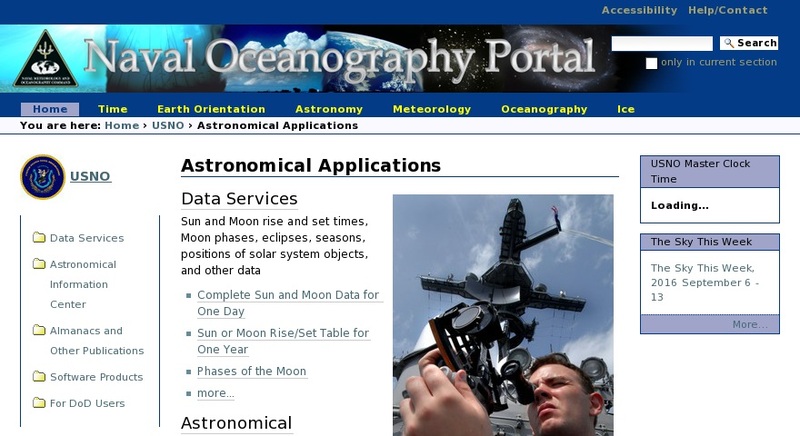 The Astronomical Applications Department of the United States Naval Observatory (USNO) provides access to astronomical data, including sun- and moonrise and set times, moon phases, solar and lunar eclipses, seasons, positions of solar system objects, and others. The publications page provides access to annual astronomical and navigational almanacs, USNO special publications, USNO technical reports, and related publications by other institutions. There are also links to obtain software such as the Multiyear Interactive Computer Almanac (MICA) and Naval Observatory Vector Astrometry Subroutines (NOVAS), software products from related organizations, and discontinued USNO software.